Contributions from the sports’ membership and other interested parties have provided the foundation for the boards of the British Softball Federation (BSF), the British Baseball Federation (BBF) and BaseballSoftballUK (BSUK) to develop comprehensive proposals to transform the way our sports are organised and administered. The proposals for changing the structure of our sports are based on the principles agreed by the three parties following analysis of feedback from consultations and the boards’ own discussions. In the coming months and with members’ approval, the Structural Review Project Group (SRPG) will facilitate agreement between the parties to implement the agreed changes. The target date for implementation of one of the core changes – a restructured, single organisation – is April 2017. Essentially, we all recognise the need for an integrated, clear vision for the future of both sports working together. The Boards of BSF and BBF commend these plans to their memberships. Relationship between BSF, BBF and BSUK. The three organisations’ relationship is defined by an Agreement between the Federations as to how they interact with BSUK. However, over time it has become apparent that the provisions of the Agreement have become less relevant, and the interaction of the three parties less efficient and difficult to administer. Thus a need for a review of – and potential changes to – the relationships was required. The decision to carry out a fundamental review of these relationships was jointly agreed in 2013. Since then the process has moved forward through preliminary discussions to the formation of a working group in June 2014 with representation from each party and, coupled with the support of Sport England, the appointment of an independent panel of advisers to facilitate the process. The three boards having agreed on the need for a critical review, it was determined that future action should be sympathetic to the needs and wishes of the membership of the BSF and BBF (being the two sports’ national governing bodies), and informed by BSUK’s knowledge of the wider sports environment impacting on the sports’ development and funding. In the autumn of 2014, the lead facilitator, Alistair Gray of Renaissance and Co., canvassed the views of 100+ contributors from within the sports and across many (NGBs), other sporting bodies and funding agencies. He then attended the BSF League Heads’ Forum in Birmingham and the BBF AGM in Leicester to hear further views of representatives of the sports’ community and their ideas for change and improvement. The complexity of three bodies all separately involved in leading the sports has resulted in confusion over roles and responsibilities. A significant majority called for integration of governance. Changes in structure and the working relationships between the parties was necessary for the sports to become more effective and efficient. Increasing participation in both sports was an absolute requirement for our future development. Strategically: The need for an integrated, clear, vision for the future of both sports working together. With the needs for the future defined, in August 2015 representatives from BSUK, both Federation boards and other contributors held a forum to determine in more detail the new structure required to best drive the sports forward. The need for an unambiguous leadership structure, including a democratic election process working through a congress or convention with widespread representation of all current players and officials, plus those groups in universities and new leagues as yet outside formal membership. A smaller, more efficient board structure with a single CEO: the Members’ representatives to be selected on basis of relevant skills and abilities. Independent directors to be selected by the board after scrutiny by a nominations committee including sports’ representation and ratification by the congress. Continuing opportunities for volunteers within the organisation to contribute to running leagues, national teams, international competitions and other aspects of our activities, working together with staff members to effect the best outcomes. In delivering the needs of both sports and their development, the BSF, BBF and BSUK boards have been very aware of the input of playing members as reviewed above. Detailed structural proposals consistent with the above principles are in process of being drawn up. With Members’ approval in the coming months, these will be finalised for agreement between the parties, with a target date for fulfilment of the first integration process – a restructured, single organisation – to be effected by April 2017. The Boards of BSF and BBF commend these plans to their memberships and will continue to seek input as the process evolves. This Baseball Softball United microsite will host information on how these plans develop as well as promoting opportunities for involvement and feedback in the process. 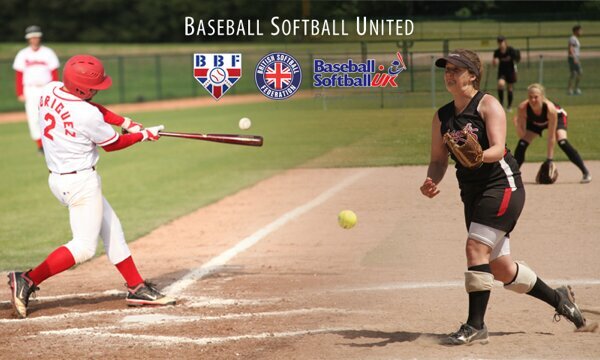 The British Baseball Federation and the British Softball Federation are the National Governing Bodies (NGBs) for baseball and softball in the UK. Since 2000, BaseballSoftballUK (BSUK) as the development agency for baseball and softball in the UK, has provided services to the BBF and BSF with the aim of developing and increasing the levels of participation, skill and achievement in the sports. This occurs at both youth and adult levels, from school and grassroots through domestic adult clubs up to the Great Britain national teams. Sport England granted BSUK £3m for the period 2013-2017 in response to its Whole Sport Plan. Projects include regional support for youth baseball and softball development programmes, support for workplace softball, coaching and coach training, facility development, and expansion and strengthening of clubs throughout the country, including helping with the achievement of Clubmark accreditation.